It seems my life’s journey falls neatly into four F’s: faith, family, friends and food. But it wasn’t always that way. Four and half years ago, after struggling to find meaning in Judaism—and then looking elsewhere—I discovered a Jewish way of life that I didn’t know even existed. Like many people, I grew up going to temple on the high holidays. I had a beautiful bat mitzvah and confirmation and sang Jewish songs with the youth group. Later, as an adult, I dealt with the fact that my own brother, and my husband’s brother, married outside the religion. Our young children were the last Jews on both sides of the family. My own soul-searching continued. I discovered a Jewish way of life that I didn’t know even existedThen one sunny day in 2006, as the High Holidays were approaching, I began searching for a place to go for Yom Kippur—we had since let our temple membership lapse and couldn’t afford to pay for tickets. A quick search on the Internet pulled up some synagogues and names I wasn’t familiar with. I made some calls and ended up speaking casually with a local Chabad rabbi. Sitting at my kitchen table, I asked lots of questions. “Come, bring your family, it doesn’t matter what you wear or how much you know,” he assured me. I was hesitant and a little intimidated, but we tried it. Soon after we were invited to an elegant, traditional Shabbat dinner, and I was truly hooked. I wanted more, and fast. My husband, to be honest, wasn’t as enamored as I was with this newfound Judaism. We struggled a lot to find a peaceful balance. But he relented, gradually. And I tried to take it slower. Now, we both continue to learn and grow despite a few bumps in the road. We work to decipher the meaning and practical approach to all the laws and traditions we are discovering, and how to apply them to our lives. It’s been somewhat treacherous navigating this path. It became almost a complete transformation, one that is best approached in small doses—which I learned in hindsight. We started by lighting Shabbat candles and having Friday night dinners, and then keeping the family purity laws. I remember the first Shabbat after I learned what “Shabbat” was—we were in the library and the lights seemed so bright. Being there felt so wrong. Our kosher observance has continually increased—two steps forward, one step back. I’m learning how to re-navigate my own kitchen. Food has continued to be a big source of both contention and inspiration, as we learn what to eat, what blessings to say, and when to be less rigid for the sake of family harmony. I’m starting to make peace with my past and am learning to focus more on the present. We have friends from two different worlds now. Since we still live where we grew up, our entire family is here to witness the transformation. For the most part, they are starting to accept our new way of life. We’ve learned the beautiful term “baal teshuva,” and it’s become a phrase to which I sometimes cling in order to validate our way of life. I realize there are still many naysayers, including in our own families. But our religion encourages us to constantly question, to dig deeper. We’ve been to different synagogues of different denominations, traveled to other communities, met people who practice more and less than us. We’ve asked lots of questions. And we’ve found the right path. As of last month, we finally live within a mile of Chabad and now have a real, albeit small, community to support us. My husband and I are confident in the way we are raising our children and the life we are leading. It feels like a giant achievement to have gotten to this point. I’m rediscovering every day that each person has his or her own journey and paceI’m rediscovering every day that each person has his or her own journey and pace. The key, I think, is not to judge others, and to be an example of goodness. Every interaction we have offers the opportunity to impact others in a positive—or negative—way. I no longer judge my family for doing less than we do, or my parents for not teaching me more. In the book of Exodus, we read about how the children of Israel finally escaped generations of bitter slavery in Egypt. The women, led by Miriam, were so sure of their fate that they had made their own tambourines to celebrate their eventual freedom. After a few diversions, the Jews did reach freedom, and the women finally got the chance to sing and dance in celebration. Throughout all the turmoil, they remained positive—even encouraging those around them to do the same. It makes me wonder if it was their certainty and faith in a good outcome that ultimately made it so. And I wonder how we can apply that lesson to our own lives. 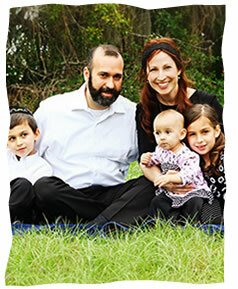 Beautiful story, similar to mine, always learning from my wonderful Chabad friends. Such a wonderful sense of community. I always have questions and always get the answers from them. The Fifth "F" Wow, what a beautiful story! And I think your final thought is applicable to so many things, religion, and just life in general. It gave me chills. I have been searcing now for a few years trying to find balance between an old way of living, and a more religious direction. Beautiful! It's been a pleasure and a privilege to have been a witness and a part of your beautiful and inspiring journey. Kol Ha'Kvod and may Hashem continue to bless you and your family with the five F's and more! coming home It is so beautiful to read when a Jewish family are discovering their roots. I pray that you and your family continue to dig deep into the Torah. That is a big blessing for us around you, people like you light the path for us Gentiles.